You are here: Home / Discover / Products / The Touch, the Feel…of CASAROVEA! The Touch, the Feel…of CASAROVEA! When finalizing your place setting, linens are important. The napkin is the first and last material your guests will touch when they sit down in your dining space. 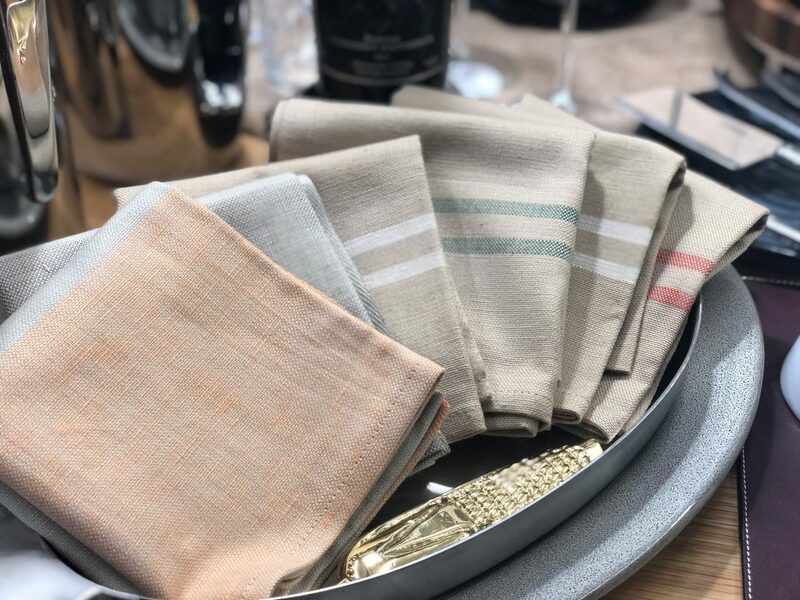 We’re seeing a growing shift in focus in this product category nationwide—more of our customers are ditching the drab and starchy polyester rental linens for thoughtfully curated, bespoke alternatives. Starting at just $2 per napkin, you can incorporate this elevated element to your tablescape today. CasaRovea brings to the scene a linen collection designed for every occasion. A table setting is truly the canvas for a chef’s culinary creations, and CasaRovea’s unique and exceptional napkins and tablecloths bring that setting to a higher level of style. They dress the table with elegance and are completely customizable to match your aesthetic and vision. Color, pattern, logo, and even texture can all be matched to your specifications. CasaRovea’s attention to even the smallest of details is easily appreciated, but it’s their attention to the environment that makes them a perfect partner for LMT. Their new eco-friendly collection maintains the integrity of the product while reducing their carbon footprint. CasaRovea uses natural cotton and linen fibers. These eco-friendly napkins utilize shorter yarns that would otherwise have been wasted. The result is a distinct product that is strong enough to hold up to the rigors of hospitality, but soft to the touch, in line with CasaRovea’s impeccable sense of design, and friendly to nature. We strive to offer our customers distinguishing elements that become the signatures of every setting. By sourcing the best and most design-forward products available, like Casarovea, we’re able to help chefs and operators enhance their guests’ dining experience. By making a conscious effort to partner with manufacturers who use their available resources efficiently and responsibly, we’re able to reduce our environmental impact in the process. For more information about CasaRovea linens, please reach out to lmt@singerequipment.com. https://lmtprovisions.com/wp-content/uploads/2018/11/casa-rovea-eco-friendly-pier-1024x768-1-1.jpg 768 1024 LMTprovisions http://lmtprovisions.com/wp-content/uploads/2018/11/LMT-Email-SM2-002-1.png LMTprovisions2018-11-14 08:00:472018-12-12 15:25:30The Touch, the Feel…of CASAROVEA!